According to latest rumors AMD is going to launch their Zen based processors on January 17th. 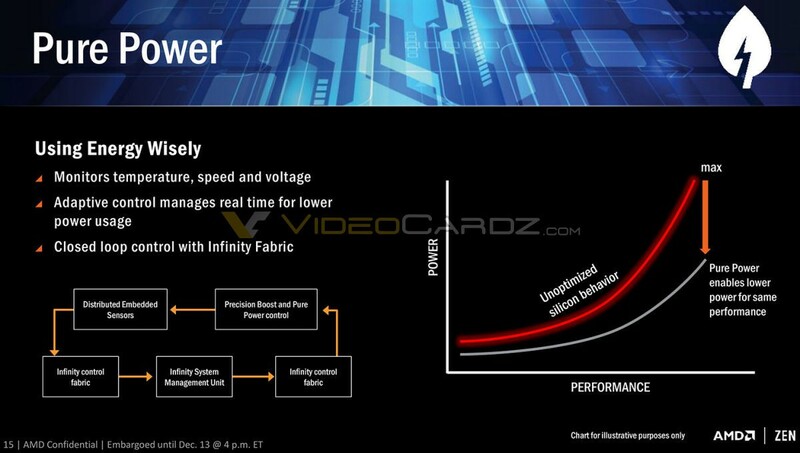 Meanwhile a few new slides have leaked revealing additional information on these CPUs as well as the marketing name. AMD will promote these new CPUs using “RYZEN” as a brand name. 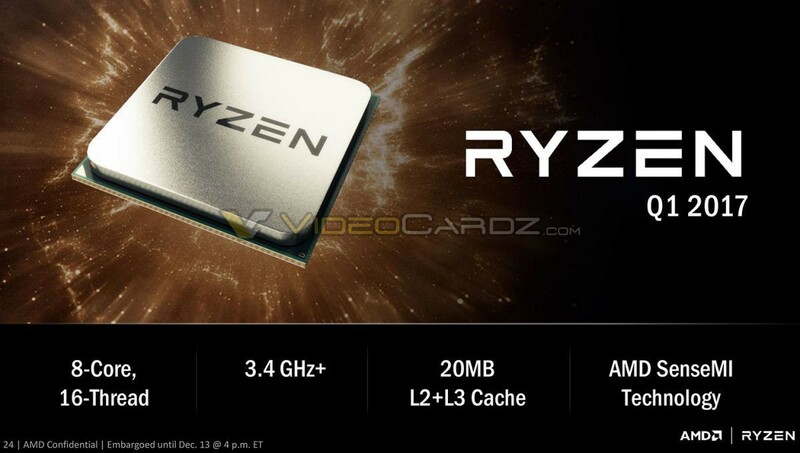 Having a closer look at the slides leaked by Videocardz, the Zen-based “RYZEN” chips will feature 8 cores, 16 threads and 20 MB auf cache, while there are 8 x 512 KB L2 and 2 x 8MB L3 cache. We’re curious to find out more about the implementation since the fact, that there are 2 x 8 MB L3 cache could suggest that this CPU is based on two modules with 4 cores and 8 threads that have been stitched together. 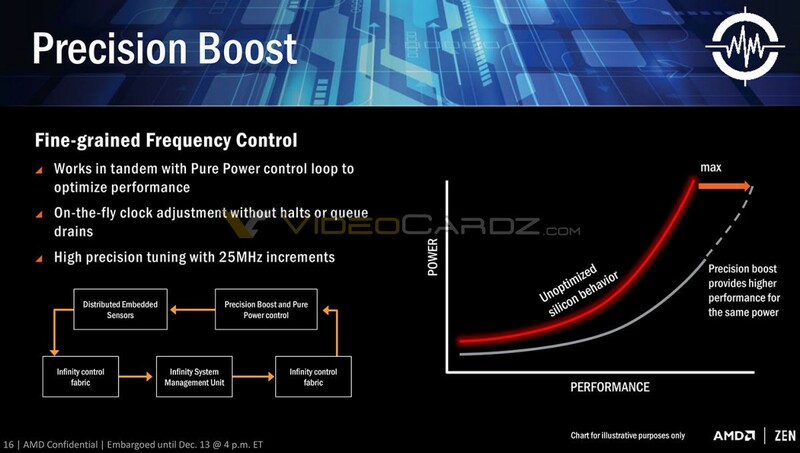 On these slides for the first time clock speeds have been shared, stating that the new CPU will run at 3.4 GHz+. Keeping in mind that for example the FX-9590 clocks with up to 5.0 GHz, the 3.4 GHz+ sound very conservative, yet it implies that AMD must have made huge IPC improvements. The interesting part about these “low” frequencies is also that these chips are most likely going to be manufactured using 14nm process technology. 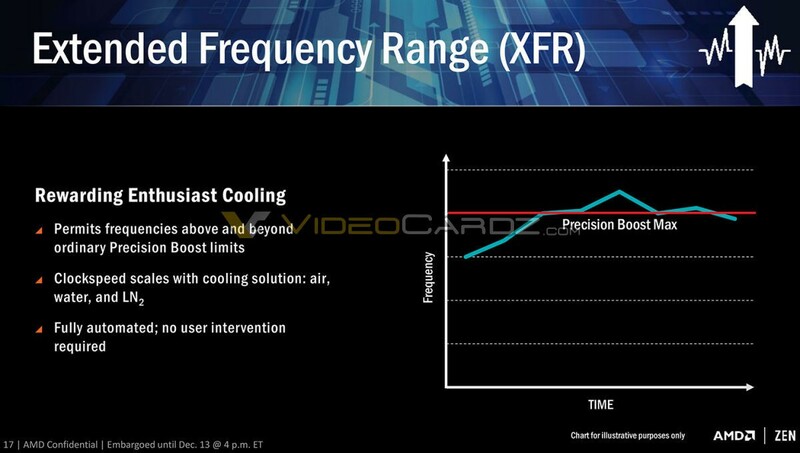 Since the old FX processors are based on 32nm process technology there might even be great overclocking headroom available, because usually “shrinks” allow for an increase in clock speeds. All this sounds very compelling and it certainly increases the hopes that AMD might finally have a competitive CPU in its portfolio again. Now we’re even more curious about tonight’s New Horizon event and we’re very much looking forward to seeing a live performance demo of RYZEN.